I have just completed my Sewing with a Plan adventure. Eleven garments that work together. Here is the specification again (paraphrased) from Artisans’ Square, the site which generously hosts the competition. All the tops should work with all the bottoms, and the wildcard garments should work with every other item. At least one garment that is reversible, transformable, or upcycled from another garment. For instance: a dress that can be worn as a shirt, a pair of pants that can roll up to be worn as shorts, or a jacket that can also be a dress. “Upcycling” includes remaking an older garment into something new, taking a vintage pattern and modernising it into a more current style, or recycling the fabrics or notions from another item to incorporate it into something new. One garment may be previously sewn; another may be purchased. I want to explain how my garments meet the rules, and the philosphy behind them. Once the photographs are submitted to Artisan’s Square they are simply numbered, with pattern and fabric details added. They do not have a story, or a philosophy or explanation alongside them. At one point we were encouraged to explain their purpose (eg work outfit) but this seems optional. I started off with a couple of obvious choices – a reversible skirt, and a recycled top. I wasn’t overjoyed with my efforts, but I was glad to have had the experience. 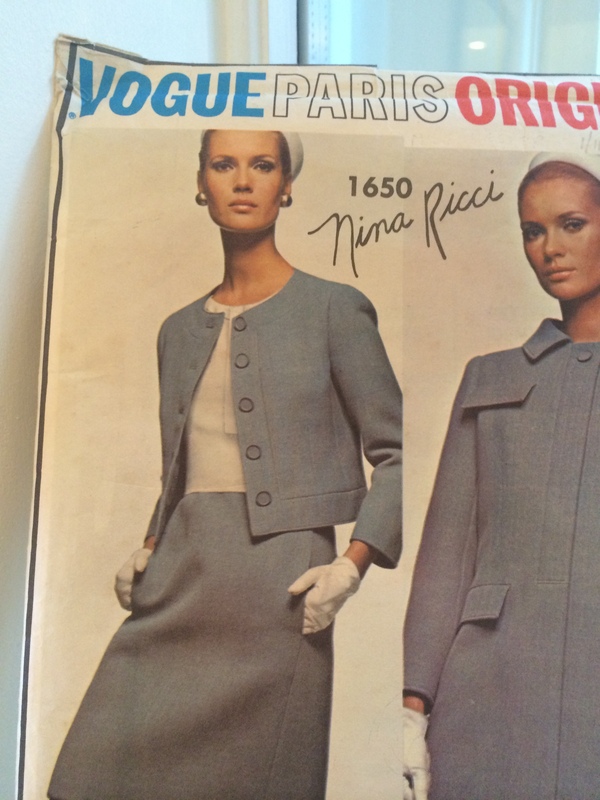 It was only when I started investigating a 1966 vintage pattern I had always wanted to make (Vogue 1650) that I discovered the concept of a formal suit-type skirt that was made without a waistband. The skirt was designed to be attached to a silky camisole which meant it would hang beautifully underneath an overblouse. This style was fairly common in 1960s couture. I had the idea of making the camisole in silk, like a piece of underwear, but to paint on it with silk paints so that it could be worn as outerwear. I wanted something that looked like a skirt and sleeveless blouse, rather than a skirt and vest. Then we get a little philosophical. What is the difference between under and outerwear? Indoor clothes and outdoor clothes? Summer clothes and winter clothes? Nightwear and Daywear? Morning suits and Evening dress? Menswear and Womenswear? I have argued before that a dress (bifurcated item) is only obviously women’s wear in cultures where men only wear trousers. It is social conditions and culture that determine these things. So, within the rules of the competition, I began to explore this idea. The dress that is also a blouse, or trousers that can be rolled up and transformed into shorts are mentioned in the rules. Have you heard of “transformers?” I must admit I only know of this due to my grandson Ted’s intense interest in such things, one specifically he refers to as “Bunglebee”. This is a car which “transforms” into a robot – you can see how some of the car-elements – wheels, doors and windows. So at heart my entry to the SWAP includes garments which have been transformed by me, in the process of making them (“taking a vintage pattern and modernising it into a more current style”) but also, where I can, I have preserved some options in terms of wearing them differently. The skirt on a vest can be worn with the overblouse, or with the jacket, so that the vest disappears as it was originally supposed to do. When I turned the skirt-on-a-vest into a dress by making the skirt from the same silk as the camisole I decided this collection is “dynamic”. The other issue is to determine if everything “works with” everything else. To some extent this is a matter of opinion. Some people have strict rules about what does and doesn’t “work with” or “go with” something else. Others do wonderful but surprising things. Some people have no idea and create a look that can seem discordant to those of us with sensitivities about these issues. I think my “collection” is a collection of clothes that do work together. 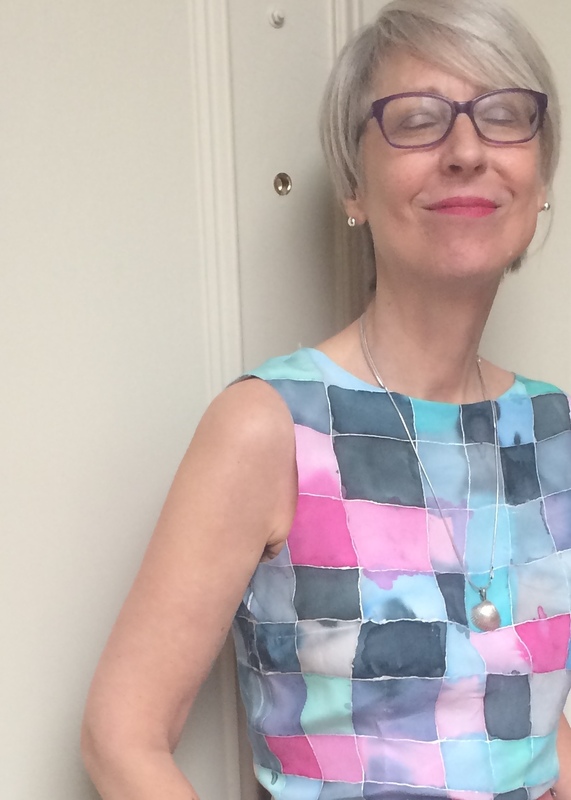 I asked myself the question – if my clothes were in a shop, could they be hung together to suggest outfits the shopper might choose to purchase (at this point I had not finished the dresses)? This is somewhat tricky. Due to my commitment to only buying or making clothes in my personal colour palette (cool-bright) everything in my wardrobe (IMO) works with everything else. The same is broadly true with the styling. I have a few basic shapes that work with my figure and combine effectively. For example I have two sort of skirts – A lines and pencils. My collection has both. I also have two types of jackets – a fairly straight cardigan type jacket with a Nehru type collar or none, or a more shaped longer length jacket. The three jackets in this collection conform to these archetypes. So, deliberately, I have chosen shapes which work together. The photographs on Artisan’s Square show a good range of mix and match options. I will have to leave it to others to decide if the items work together or not. I think we have a winner here for SWAP ’15. You have put so much thought into each and every garment and they are all beautifully made. It’s gorgeous. Ruth – you made me cry. I don’t want to be a winner, I just wanted to achieve something I could love. You are my inspiration – I found SWAP by following your mighty blog and I was blown away with your collections. This year you will produce something stupendous again (handsewn!!) – I can’t wait to see all the collections. Bloody gorgeous missus! I think I should bite the bullet next year- what do you think? Absolutely you must! I am surprised you haven’t been tempted before. It may slow you down a bit but I think you would like the rigour and the structure. Instead of cranking out garments that look like costumes, you put a huge amount of thinking into the production and completion and learned so much along the way. By varying the eras and shapes and colors you have made some of the nicest fashions ever! 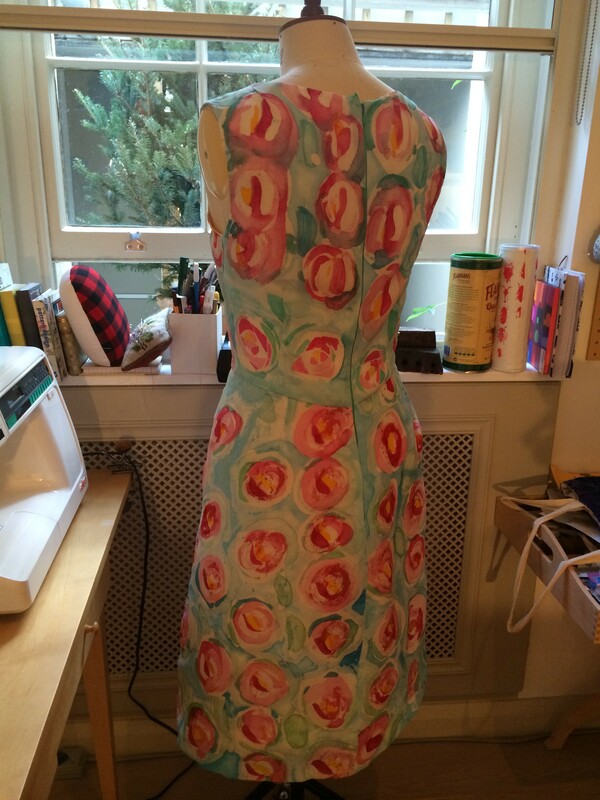 If anyone needs inspiration as to what is real sewing…you are the girl to do it. We learn so many things by seeing your thought process and execution of techniques we may never be bold enough to try (dyeing) but the results are magnificent! While making clothes for yourself, a competition, or just for fun you take us on a wonderful idea filled journey! Thank you, Kate, and best of luck! You have worked so hard on these projects I have been following your progress, willing you on. As someone who usually takes the path of least resistance, your willingness to experiment when aiming for a deadline, has astonished me. Your garments all work together stylistically and they co- ordinate with each other, indeed they would grace many a high end store rail, I love it that you’ve kept the integrity of your preferred style. I can see you wearing and enjoying these pieces, they are a labour of love. You’ve got my vote. Well done! Annie – thank you. You are very generous and I appreciate the advice and support you have given me throughout – everything you have suggested has been spot on. Congrats Kate! It is a fabulous collection. I enjoyed every blog along the way. You most inspiring and a delight to follow. Fingers crossed, but your already a winner in my book! What….will you do next? Kate, I agree with all of the prior comments. I am always delighted by your posts, your creativity and your generosity. 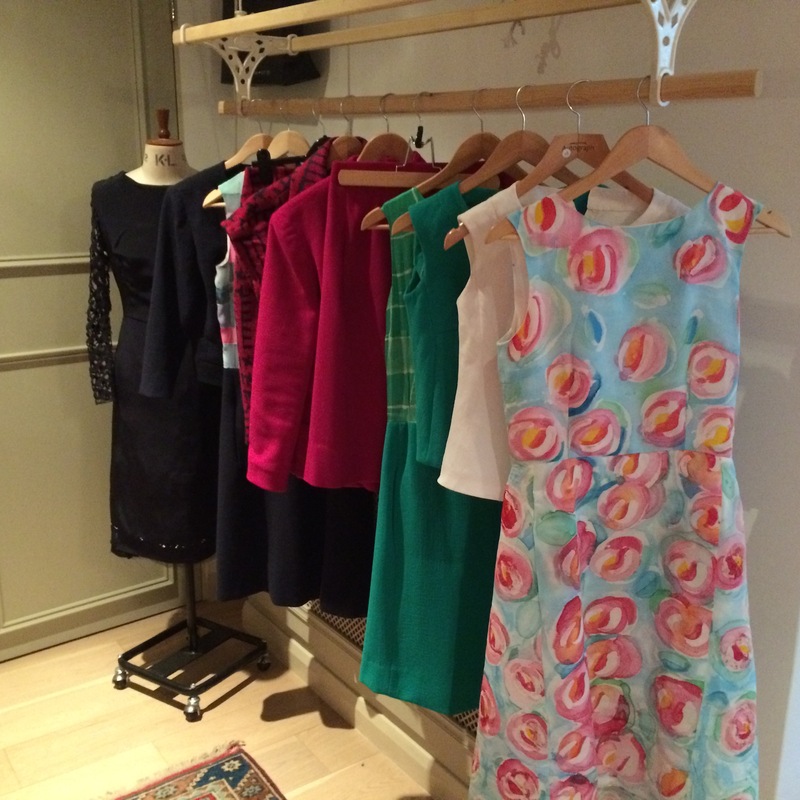 The collection is unique and personal and gorgeous all in one – much better than would grace a high-end retail rail. Thanks for introducing me to SWAP, as I have loved working towards this goal this year and can’t wait to try it again with more skill and a better eye. So much fun! And PS, seeing everything together I vote for the floral dress. The dinos are lovely but I don’t see this collection as austere. It’s more playful, to my eye. But whatever you choose I’m sure you’ll style it beautifully. I have thoroughly enjoyed following along on your SWAP process. Regardless of what the voting outcome is, your collection is a winner. I am struggling with fit issues on my SWAP, and also struggling with what I would like my style to be, but reading what you shared along the way has helped encourage me to try to complete my own SWAP. It is a beautiful collection which holds true to your style choices. I have so enjoyed reading about your deliberations, the various garments, and your wider philosophical questions. The collection looks great as a whole, and I feel familiar with many of the individual items as well, having followed the stories of some, if not all, of them. Personally, I’m particularly drawn to your painted silk items: they just look so lovely, and make me envious that I could not achieve that level of creativity in a million years. Hope that you are now enjoying a well-deserved celebration of the conclusion of a major project! Lovely collection of classic garments. I too especially like the handpainted silks. Oh Amanda – think seriously about joining in next year. It is such an interesting challenge. You can use it to develop your skills and really experiment with what suits you. I also got alot of wear out of everything I made for last year’s SWAP. Lovely, lovely garments! Both yourself and Ruth have produced fabulous collections, love them both! You attention to detail is amazing, and I think that the colours go together beautifully!